Valsad : A stone weighing 1.4 kg was removed from the urinary bladder of a patient and the doctor who operated upon him claimed that it was the single largest bladder stone recorded in India. The doctor claimed that medical reports confirm that this is the biggest such stone ever removed from a patient’s body in India, and second largest in the world. 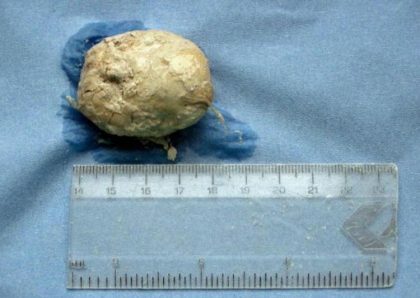 The doctor claimed that the largest recorded bladder stone in India weighs 1.34 kg. He added that the hospital will be applying to the Limca Book of Records for removing the largest bladder stone from the patient’s body.